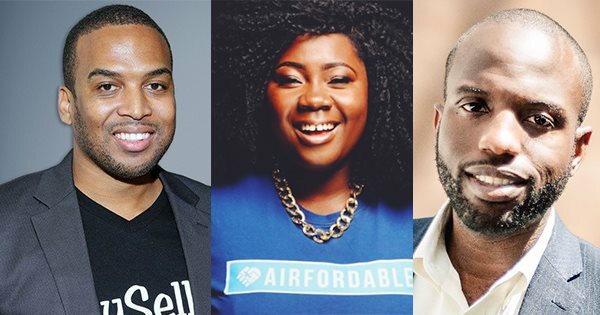 Jibril Sulaiman, founder of Pay Sell Co; Ama Marfo, founder of Airfordable; and Jide Ehimika, co-founder of Noirbnb. AFRICANGLOBE – There are hundreds of software and technology companies in the U.S. Some of the top well-known ones include Facebook, Twitter, Microsoft, and Google — But there are also many successful technology companies in the U.S. that are Black-owned. #1 – Pay Sell Co. – a Black-owned software company based in Pensacola, Florida that specializes in e-Commerce solutions. Founded by Jibril Sulaiman, the company is ranked #484 on the prestigious Inc. 500 list. #2 – Innclusive – was founded by Zakiyyah Myers, a mother of two. This online lodging site gives Black travelers and hosts more options when it comes to booking vacation sites and offers an experience free from racism. #3 – OnceLogix, LLC – this North Carolina-based technology company offers web-based solutions to simplify the operations of healthcare organizations. #4 – LISNR Inc. – this company was founded in 2012 and is the creator of Smart Tones™, a new ultrasonic communication protocol for sending data over audio. The company was founded by Rodney Williams, CEO and founder. They are a leader in advanced ultrasonic audio technology. #5 – HBCU Connect – founded in 1999 by Hampton University graduate Will Moss. Based in Columbus, Ohio, the company was the first African American targeted social network and continues to be the #1 online destination for Black college students and alumni. #6 – Rapier Solutions Inc. – this technology/engineering consulting company is based in North Carolina. They use technology to provide solutions for companies in services, logistic management, financial services, risk management, and project management. #7 – Noirbnb – was created in Atlanta, Georgia, in 2015. The company specializes in providing safe and welcoming spaces for Black travelers to rent. It was founded by Stefan Grant and Jide Ehimika to help people of color to connect with each other on a global level. #8 – Global Commerce & Services, LLC (GCS) – this Louisiana-based information technology company was founded in 2000. The company provides services in the areas of IT Solutions and Systems Engineering, Cybersecurity, Local Area Network/Wide Area Network (LAN/WAN) Development and Support, and Program/Project Management. #9 – Netcom3 Global Inc. – helps businesses and large corporations solve technology issues and assists in setting up new devices and services. They offer 24/7 service for computer needs, including installing and setting up hardware and software, removing viruses, and troubleshooting. #10 – Airfordable – offers payment plans for airline tickets. It allows customers to search and book flights and spread the cost of their airline ticket via a payment plan. The company offers easy, flexible payment plans. #11 – CallBase – this Nigerian-based company specializes in setting up call centers for companies. Founded by Oo Nwoye and Opeyemi Obembe, the company allows organizations to buy a call center number from 50 countries. #12 – Andela – this company recruits top software developers and then connects them to top employers on the African continent, including IBM and Microsoft. #13 – Visage Payroll, Inc. – this Dallas, Texas-based company produces payroll products for small businesses. The company was founded by Craig J. Lewis, Founder & CEO. Previous articleIf You See These 9 Symptoms, Do An HIV Test Immediately!! !